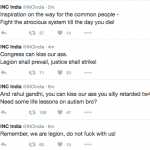 An anonymous hacker group is at war with the Congress party. 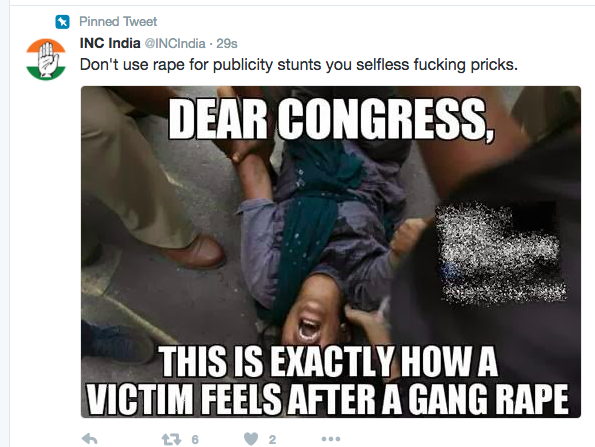 The account, @INCIndia, is verified and has 13 lakh followers. 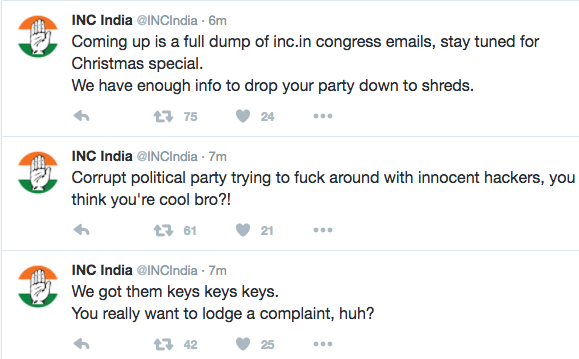 Like with Rahul Gandhi, the official Congress account is currently sending out some very strange tweets. Incredibly, in Wikileaks style, the the hacker has threatened to release a full dump of Congress’ emails. Wikileaks, earlier in the year, had released all emails of Hillary Clinton’s campaign manager John Podesta, and several instances of corruption and wrongdoing were revealed, which many thought that caused Clinton to lose the American Presidential election. The hackers have also claimed that they have the “keys keys keys” to the account, which suggests that that they might have a higher level of access than previously imagined. Update: The official Congress website, www.inc.in, also appears to have been hacked and taken down. It is currently listed for sale.